Strap in for the most epic spectator sport this side of the megapocalypse. Gather your squad of giant killer robots (GKRS), build your deck, and face your rivals in the ultimate fight for fame, fortune and sweet salvage rights. Scheme, strategize and strong-arm your way to victory as you dominate the media landscape, one billboard at a time. GKR: Heave Hitters is a standalone, customizable tabletop game for 1-4 players, combining high-quality collectibles with die-rolling, deck-building and tactical play! 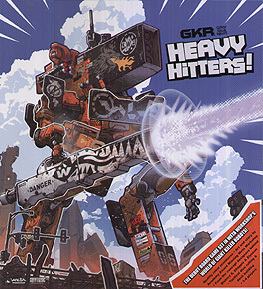 Pilot your Heavy Hitter (the biggest, baddest robot on the board) and a squad of three support units through the ruins of an old city, competing to either wipe your opponent off the map or reduce four skyscrapers to rubble.